Show your support of wildlife and conservation in South Carolina and help provide vital funding to conserve our wildlife and aquatic resources. The SCDNR License Plate Series are specialty plates that are available to the general public. Each plate portrays the importance of natural resources in our state from saltwater recreational fishing and hunting opportunities to conservation of endangered and threatened species. 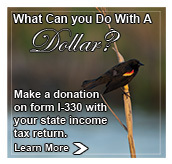 South Carolinians have the two great opportunities to help support the mission of the South Carolina Department of Natural Resources by making a check-off contribution on their state tax return using Form I-330. All contributions to the Endangered Species Fund are used specifically for research and conservation efforts aimed at threatened and endangered species in South Carolina. Funds received through the SC Department of Natural Resources Fund are used to enhance the programs and operations of the overall agency. Make your investment in the future. Help us keep wildlife in YOUR life. South Carolina Wildlife (SCW) has been published by the state Department of Natural Resources continuously since 1954 and has for many become a part of our state's outdoor heritage. SCW serves as a showcase for the state's natural resources and outdoor recreation opportunities. All profits from your continued subscriptions offset the printing and distribution costs of this award winning publication. Your purchase of a hunting or fishing license shows your commitment for conservation in SC. Now show your support for SCDNR and conservation by displaying a TEAM DNR sticker on your truck, car or boat. By buying a South Carolina hunting or fishing license, you help SCDNR conserve the state's wildlife and aquatic resources, not just those that are hunted or fished. Over 50% of SCDNR’s budget to conserve South Carolina's natural resources comes directly or indirectly from the sale of hunting and fishing licenses.